Mortgage rates fell over the past week to their lowest levels in a month and are now below where they stood at the end of February. The week was a repeat of the familiar pattern we have seen repeatedly for the past few years: Just as macroeconomic fundamentals are poised to push rates higher, geopolitical fears seize the headlines, prompting a financial flight to safe assets and pushing mortgage rates downward. Looking only at interest rates and not at the broader context, U.S. home shoppers have been indirect beneficiaries of a tumultuous world buffeted by fears of financial instability in China and Brexit over the past two years, and now fears of a global trade war. 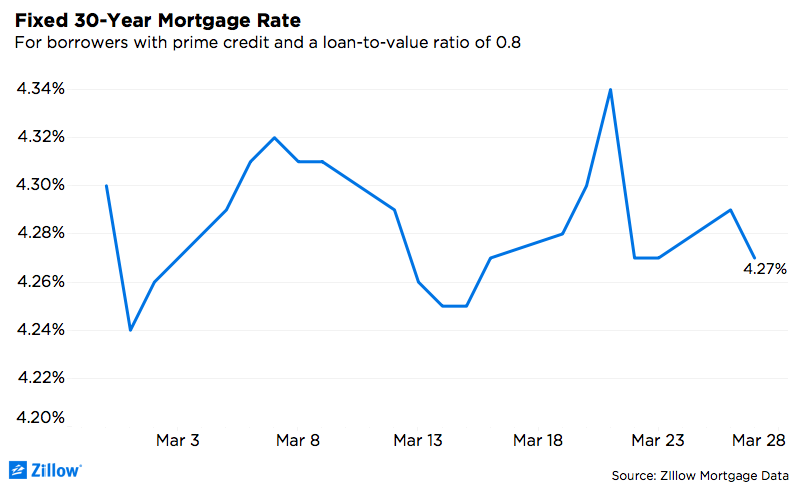 The decline in mortgage rates is all the more telling because it occurred the same week that the Federal Reserve increased short-term lending rates. After steepening somewhat during the first two months of 2018, the yield curve is again flattening. Beyond ever-present (and difficult to predict) geopolitical risks, markets are likely to watch for inflation data due Thursday as well as speeches by two Federal Open Market Committee voters early next week. Markets will be closed for the Good Friday holiday, which could temper volatility, although borrowers should expect conservative pricing going into the long holiday weekend.